Sara Cleaver with sockeye salmon. One of the reasons Sara Cleaver likes working for the North Pacific Fishery Management Council is that her workmates are as enthusiastic about fish as she is. “It is such a relief to have coworkers who don’t find your obsession with fish to be weird—in fact, it is basically a requirement of the job.” Cleaver said. Cleaver has been hired full time as a fishery analyst by the North Pacific Fishery Management Council in Anchorage, cutting short her 2017-2018 Alaska Sea Grant State Fellowship at the Council. Her fellowship would have run until October, but instead she was recruited into a two-year position that started May 21. Sara Cleaver (lower R) with North Pacific Fishery Management Council staff at industry meeting. 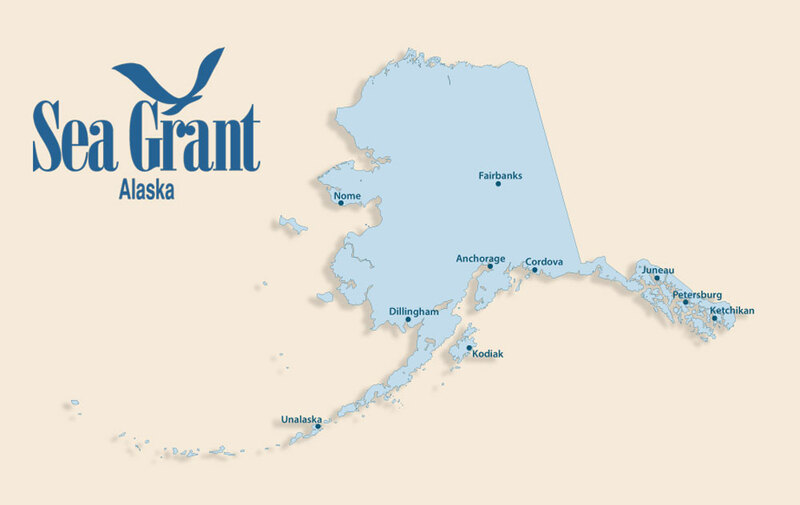 Each year Alaska Sea Grant selects several graduate students or recent grads with state or federal agencies in Alaska, to work for a year in marine science or policy-making. Sixteen fellows have been placed since the program began in 2015. “The fellowship program allows hands-on training for recent graduates, which is crucial for those looking to enter or re-enter the workforce, as well as to ensure a new generation of experienced resource managers and professionals,” said Cleaver. As a fellow at the Council, Cleaver worked on an environmental assessment and impact review for a potential new gear type for commercial halibut in the Bering Sea. This could allow fishermen to avoid killer whale depredation—when whales take fish from lines. She has worked with industry to help the Council create management solutions for this problem. Cleaver has also contributed to the developing Bering Sea Fishery Ecosystem Plan and is compiling a book of amendment summaries for the Gulf of Alaska groundfish management plan. Cleaver has a master’s degree in coastal environmental management from Duke University where she researched the highly migratory species fishery in the Atlantic. Sara Cleaver (L) and Sarah Marrinan, who is Cleaver’s fellowship mentor at the North Pacific Fishery Management Council. Last winter, her first in the Anchorage area, she took an avalanche class and did some backcountry skiing in fresh powder. And she is gearing up to do some fly fishing and hiking this summer.